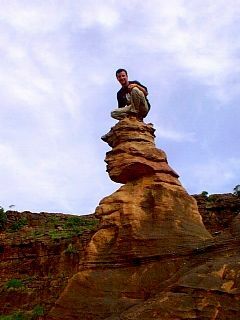 Mali has to be one of the most fascinating countries in Africa. 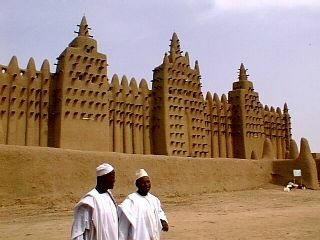 Djenne was spectacular with its history, its sights and its culture. The mosque has to be seen to be believed. 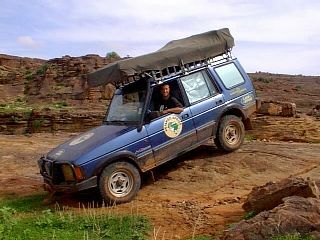 When in Mali - "If you can't go by camel, go by Land Rover" (Biddlecombe, 1993 p224). 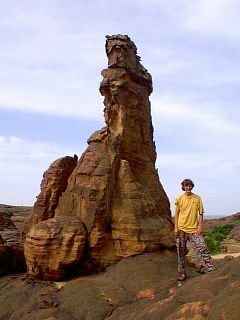 The scenery as you enter Mali from the north of Burkina is quite spectacular. Red earth, blue sky and masses of dense dark greenery. The Sahel approaches but it's getting greener! The land is reminiscent of Morocco only more impressive and brought back the feelings of amazement we felt at the beauty of Guinee. This area gets very very wet during the rainy season (August!) and the roads are greatly elevated to allow for rising water levels in adjacent fields. Already ponds were forming and birdlife was prolific. 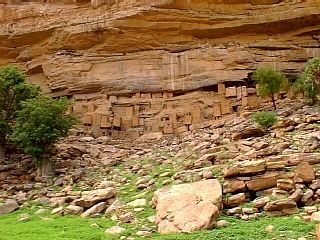 Buildings rest on rock boulders and have high doors. Compounds are common (as in The Gambia) and we were back in the land of donkey and cart. Thankfully the border formalities were quick and the officials at the regular roadblocks just waved us through, probably because they couldn't be bothered to get out of their hammocks. 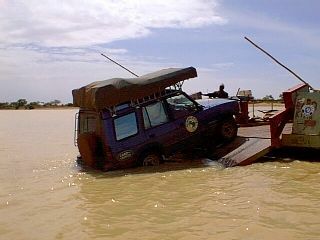 Took a rickety ferry over a quickly developing river to the town of Djenne. The flaps on the ferry didn't touch the sides of the river so we had to do a bit of wading first. 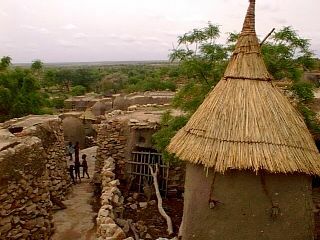 We had read in the guide books that Djenne was the most beautiful of all the Sahelian (sub-Saharan) cities and despite being touristy was worth a visit. We were not prepared for the splendour and excitement of this town. It was like stepping back two hundred years and seeing a town and its occupants as they would have been. 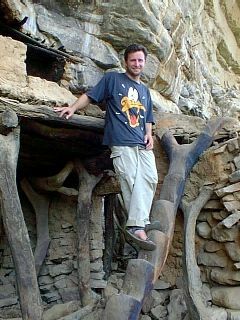 The alleys (no roads as such) are narrow between the walls of mud houses and the locals were very welcoming. We were met by the tourist officer, a demand for £2 each which was "for the commune but includes a guide" and a question as to whether we wanted to go to a circumcision ceremony! Cross-legged, Andrew managed to squeak "no, thanks" and off we went to the only campement in town where we found cold beers and plenty of flies. You get given beer mats to place on the top of your glass to keep the flies out. A late night party (part of a wedding ceremony) and the local turkeys ensured we had a sleepless night before being met in the morning by our English speaking guide who took us on a fascinating two hour tour of the town. This place is incredible. 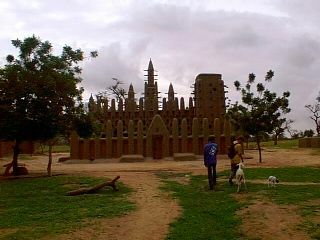 The main square has a huge mosque which has to be re-mudded each year after the rainy season. The twisting back alleys hide away goldsmiths and Koranic schools between the houses. Having a guide was essential to get a peep inside the houses. Water drains off the houses via pipes directly over the alleys and sewage also ends up in the alleys, hence a dreadful stink and a reason for the flies. A few areas of the town had drainage channels which was great for hygiene purposes but impossible for those on scooters. 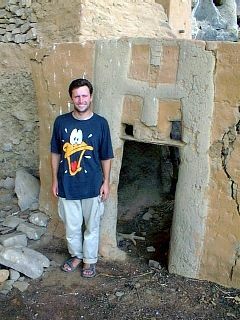 I don't think the Arabs were aware of the Romans - Pompeii had a better drainage system! We could walk around freely and not be pestered by the locals. It seems that the compulsory guided tour is working well (only initiated recently). Walked amongst Fula people with blue lips and there was even a wedding party. The market place was bustling and the locals were haggling over disgusting bits of intestines. This place is just not to be missed. It was like something out of "The Life of Brian" although I couldn't see the beard sellers anywhere. Had planned to leave that afternoon but the magic worked on us and we couldn't be bothered to shift. Instead we faffed around for the afternoon and had dinner at Chez Baba with musical accompaniment from next doors grinding mill. The bill arrived and was more expensive than expected. We discovered that when you are given a price for a meal it only covers the main part (plat divers) and not the veggies. The same happened at the campsite - they quote 1500CFA and charge 2500CFA! 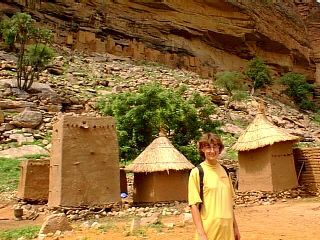 We were approached by a number of people who wanted to take us around the Dogon country. At 200 dollars for two days we told them they could stay put. 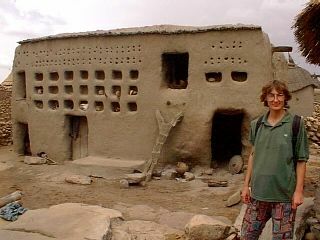 We moved on to Mopti because you have to have a stamp in your passport from here to visit Dogon. For £2, of course! The road was good fortunately as we couldn't bounce around too much since one of the suspension rubbers had fallen off. The game of "How Many Bonks" wasn't quite so funny any more. Outside the police station (where you get the stamp) we were amazed and excited to find a crashed 200TDi Discovery. We were rubbing our hands together at the thought of all those lovely spare parts - until we had a closer look. My god, this car (German plates) had seriously lost a battle with a tree. The front end had caved in so much that there was no front end any more and the steering wheel was parallel with, and two inches from, the roof. Trying to find an alternator belt would have been impossible but there, staring right at us was a suspension rubber along with a door lock but we couldn't touch it because it was being held for investigative purposes. Bar Bozo is the place to go for a bevvy and to have a look at the Badi River. 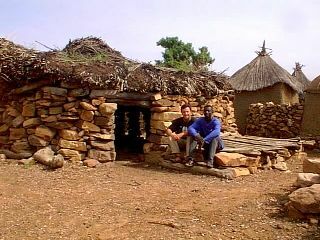 It is also the place to go to be badgered by locals offering pirogue rides over the river to visit a Tuareg village. We agreed to go although the local wasn't best pleased with our offering of a quid but it was a quid well spent. 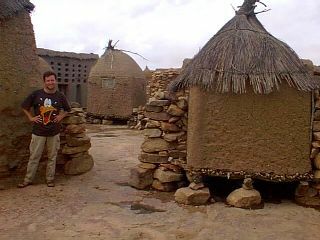 A very interesting trip indeed seeing how the Tuareg people live. 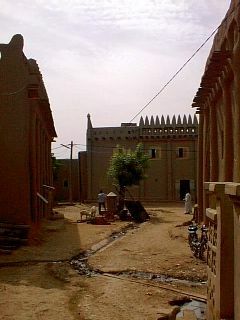 Mopti lies at the intersection of the Bani and Niger Rivers. 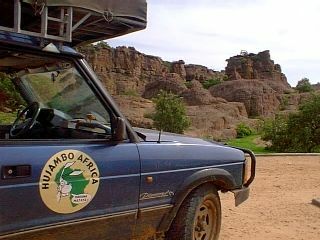 It is also the place to catch a ferry up to Timbuktu (3 days each way - horrendous). After dipping toes in the Niger we were back in the pirogue (having no motor is so boring) watching lonely flip flops (partners of those lost in the Mauritanian desert, no doubt) float by in the murky water. 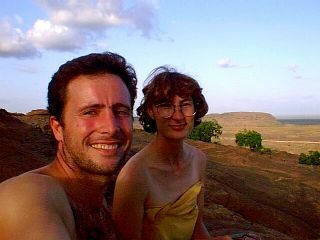 Delighted to get back in to Punda we headed off on the road to Bandiagara and a delightful campspot on a rocky escarpment. At the Hotel Cheval Blanc (highly recommended for a room, but not possible to camp) we arranged our guide for a day and a half visiting four villages in the Dogon country. 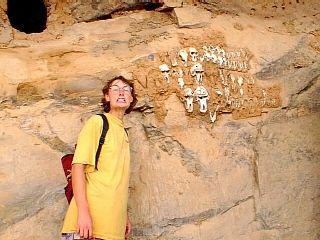 The Dogon people live on top of, and at the base of, a cliff - known as the Falaise (French for cliff). These people have maintained their traditions in their numerous villages along the 150 km of escarpment. 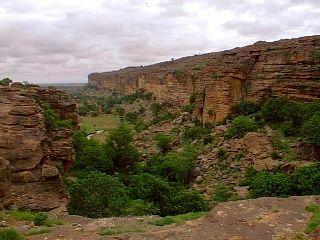 Apparently it is a trekkers paradise to spend up to ten days walking up and down the cliff visiting these villages. Our guide, Sekou, didn't speak English but we thought our French was up to it (mistake 1). Each official guide has an identity card and Sekou's was at the police station. When we checked in at the station (part of the process) we forgot to check his ID (mistake 2). Payment is a third to the guide up front, a third to the tourist office and a third to the guide at the end. In states of varying confusion throughout the day we didn't get to the tourist office (mistake 3). Before going anywhere it is essential to decide an itinerary and draw up a contract with your guide so you are all clear on the costs and expectations. We got that bit right. That afternoon we left for the first village of Sogolo. It is where Sekou's granny lives so he took her some food and we looked at the view from her roof. We also saw the "thinking house" (casa parlabaler), the "medicine house" (gnuna) [not sure of the spellings as our guide could not spell! ], the mosque, the catholic church and the animist church. Then it started to rain and Sekou took us to his brothers hotel in the hope of us buying drinks and staying the night - which we didn't. 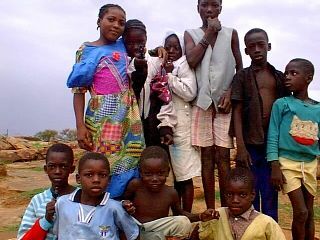 It had been planned that we would go to the second village of Djiguibombo (Dji) and spend the night there. However the road which was previously "very good" would now be "impossible" to drive along so we would have to wait until the morning. This all coincided very nicely with the fact that the village was having its annual bash that night and if we'd gone to Dji Sekou would have missed the celebrations. We were not in a position to argue about the state of the road and at this point we had already paid him a third of the fee. 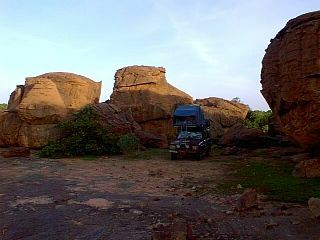 Instead we went to Camping Togona which was not owned by one of Sekou's friends or rellies. An early start as we had arranged a meeting at 7.30am. Sekou arrived with a headache, a hangover and hadn't had breakfast. He had drunk alcohol at the party (calls himself a Muslim) and had gone to bed at 3.30am. Had we not already paid him something I would have booted him out of the car. The other problem was that we didn't know the way to the villages. 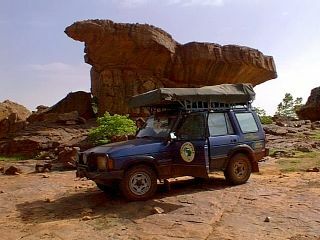 Bandiagara has made a great effort to hide away any indication of all roads within half a km of the town. After that, superb roads lead you directly to the villages. If you can get to these roads then you don't need a guide. At Dji we met the chief, had a look at the view from his roof, saw the casa parlabaler, the gnuna and the religious buildings. 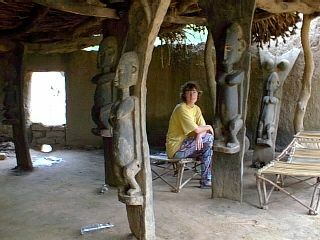 It is also customary to buy kola nuts for the "tradition of the kola nut which your guide will explain". Pah, you spend two quid on some scanky nuts and give one or two to each old geezer you see. Whatever you do, don't hold out the bag full of them. I did and nearly lost all nuts to one grabbing oldie. Then I upset the rest by not offering them any and saying they had to take a share of those grabbed by the one chap. 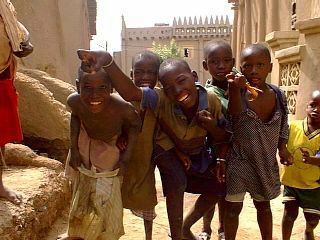 It is worth buying the nuts though just to see the joy on the faces of the old men - the "kola nut effect". We departed after making a voluntary/obligatory donation to the school! 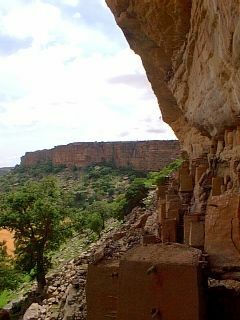 Despite the problems we had with our guide I would highly recommend a visit to Dogon Country. Their history and beliefs are quite fascinating. It turned out that Sekou was not an official guide at all (we weren't surprised) and when he asked for a cadeau war almost broke out. Two days and four villages is all that is required to appreciate the people and their way of life. In the morning we were up really early to watch the sunrise before making an early start towards the border out of Mali. The road was really good despite being labelled as "piste" on the map and we made excellent progress. It was a shame that the rainy season ruled out a visit by road to Timbuktu but six days on a pirogue would have seen me jumping in the Niger. 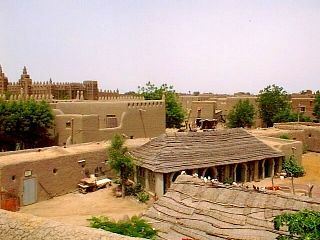 Never mind, it is only a dusty old mud town that will be covered by Sahara dunes in about twenty years (apparently). 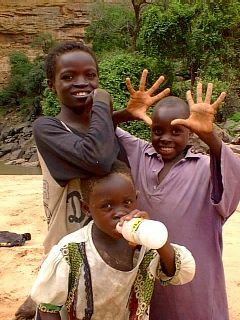 We were on our way back into Burkina. 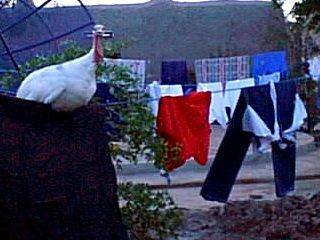 Turkey guarding the washing Excellent camping spot. Great views and rock formations Locals come on up in the morning asking if we're doctors Flood water after a particularly heavy downpour - Bandiagara Kids in Bandiagara coming to see what's going on. The back streets of Sogolo from Sekou's grannies house Roof with a view Local medical centre 'Gnuna' - The cavities hold traditional implements Sekou with some well fitting carved doors Grain stores, sitting on stones because of rain. Nowt special. Watch the prices as they forget to include the cost of the veggies when they quote you a price in the restaurants. 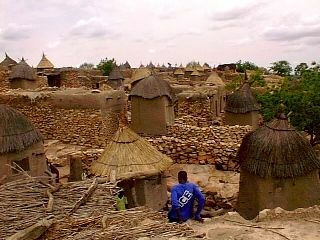 Dogon is apparently famous for their onions, although I didn't see any unusual ones. 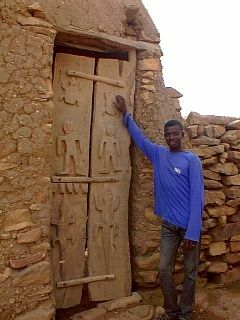 Don't organise the guide for Dogon until you reach Bandiagara. Here they have set fees for daily rates (£8 for two people), fee for each village (50p), meal (£2 per person), sleeping in village (50p per person) and a fee to get you to the Falaise and back if you haven't a car. It is 40 km in total and you can go by mobylette or donkey and cart. Inside the mosque at Djenne there is the large hall for men and a smaller one for women. Mostly the women pray at home and are discouraged from using the mosque unless they are old. There are 100 pillars inside the mosque, each one representing a god. 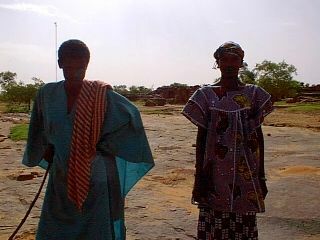 The Fula tribe have blue lips. It is a kind of tattoo that symbolises a girl is ready for adulthood. If she does not cry when the dye is being injected she is given a cow or donkey by her parents. The Fula were renowned for their massive golden earrings. However, most of them have been sold to make up for the losses suffered as a result of successive droughts.